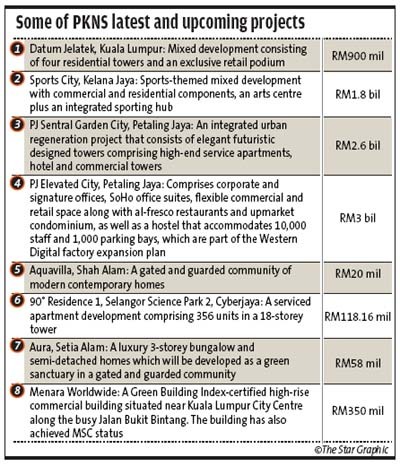 PETALING JAYA: Not unlike a few other government agencies that own large swathes of valuable land, the Selangor State Development Corp, or PKNS, is pushing ahead with redevelopment plans in some of its prime areas. A noteworthy development surfaced last Friday in a filing with Bursa Malaysia, where DKLS Industries Bhd said it had entered into a heads of agreement with PKNS to redevelop a parcel of land in Section 17, Petaling Jaya, measuring 6.4ha. This area currently houses numerous blocks of old flats, including a green reserve for the area. DKLS said the project would entail a mixed development comprising commercial, retail and residential units with a gross development value (GDV) of a whopping RM1.5bil. The area concerned has been drawing a lot of interest lately, according to property consultants. It is next to the factory area, which is in the midst of a major redevelopment programme. That area has already transformed itself to become a mixed commercial and residential hub, anchored on the Jaya One development. Jaya One is currently in its final phase of development with a GDV of RM360mil mainly for residential units, having already developed some RM600mil worth of commercial properties. Besides Jaya One's planned serviced apartments, there are currently two other similar projects being planned for Section 13. One is named Pacific Star (opposite Jaya One) developed by Island Circle Development (M) Sdn Bhd, which is a mixed development of commercial space and residential units on a 6.04-acre land. While further up the area, Fraser & Neave Holdings Bhd would be starting site works in September to develop a RM1.6bil mixed development project on 13 acres which is currently housing its factory. PKNS declined to comment for this article and said it would provide updates once plans were more firm. It is likely though that the project may have its fair bit of opposition, considering that the redevelopment encroaches on the green reserve located between Section 13 and Section 17, along Jalan Universiti. It is yet unknown if the new plans include preserving or enhancing that green area. Although the state-owned corporation declined to comment, sources familiar with the situation said that PKNS was likely to engage the affected residents in a similar way that it did when it embarked on the redevelopment of the PKNS Taman Keramat flats in Jalan Jelatek in 2010. Dubbed the 'Columbia Flats'' for its drug and vice dens during the 1980s, the flats are to be replaced with a RM900mil mixed-development project called Datum Jelatek. The project comprising four 45-storey buildings of residential and commercial units, a hotel and shopping mall, would be developed by PKNS and its subsidiary company, Worldwide Holdings Bhd. PKNS had compensated RM250,000 to RM300,000 for each house and RM450,000 to RM500,000 to business lot owners of the Taman Keramat flats. 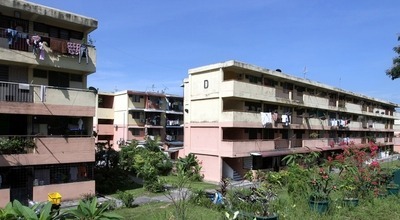 As for the plans for the Section 17 redevelopment, it had been previously reported that PKNS' business development engineer, Yeo Cheng Chuan, and DKLS Industries Bhd senior manager Yee Chee Yong had proposed a replacement unit at the new development in the same location for the owners of the Section 17 flats. The report said that residents of the 592 sq ft units would be given a 700 sq ft unit in the new development. On top of that, there was also a proposal for a RM5,000 moving-out allowance, RM8,000 moving-back allowance as well as a rental subsidy of RM500 per month until the project is completed. In addition to that, the leasehold period of the new development would be renewed to 99 years instead of 30 remaining on the existing titles. Last year, PKNS had put the market value of the units at RM96,496 (592 sq ft at RM163 per sq ft) each. If those plans materialise, it does seem as if the current flat owners would be getting a pretty good deal, considering that another up coming development named Pacific Star, which is located a stone's throw away, is selling for a far higher price. PKNS is also embarking on several large-scale redevelopment projects, including the Sports City, Kelana Jaya, which is where the PKNS Stadium is located, via a joint development with Melati Ehsan Bhd. It is also developing the PJ Sentral Garden City, a RM2.6bil joint-venture redevelopment with Nusa Gapurna and the Employees Provident Fund. Nusa Gapurna group is the same developer of the 348 Sentral project in Jalan Tun Sambanthan, Brickfields. Another PKNS project in the pipeline is the PJ Elevated City, a RM3bil mixed-development project which is also part of the Western Digital factory expansion programme. Industry sources said that with ownership in different key projects around Selangor, PKNS was likely to retain ownership of a few of the valuable properties to enable itself to venture into becoming a real estate investment trust (REIT). Previously it had called off a proposed venture with AmanahRaya REIT (ARREIT) to inject some key assets into ARREIT. It is understood that PKNS changed its mind about the injection as it wanted to look at the other properties it was developing, as possible injections into a REIT. 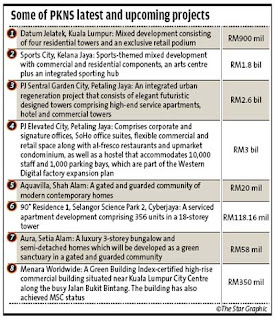 Hence, it is likely that PKNS' REIT injection plans will resurface again at some point, judging from the many other strategically-located redevelopment and urban regeneration projects in the Klang Valley it is working on. PKNS general manager Othman Omar is reported to have said that the state-owned corporation would be adding another RM6bil worth of new projects by the end of 2012, in addition to the RM14bil that was already announced. KUALA LUMPUR: Fraser & Neave Holdings Bhd (F&N) will start seeing a new revenue stream from property development come its financial year ending Sept 30, 2016, as it will be launching a RM1.6bil mixed development in its ex-dairy premises in Section 13, Petaling Jaya, in June 2013. “Currently this 13-acre land houses F&N's dairies production plant. Site preparation works will begin this September, and will see a mixed development which consists of an F&N tower, a hotel, offices, retail outlets and residential suites by June 2013,” F&N chief executive officer Datuk Ng Jui Sia told a media briefing yesterday. For F&N Dairies Malaysia, production of its new Pulau Indah facilities in Klang has just commenced, and the shift from its plant in Section 13 to Pulau Indah is expected to be completed by September. F&N is partnering FCL Centrepoint Pte Ltd, a subsidiary of Frasers Centrepoint Ltd (FCL), to develop this ex-dairy premises. FCL is one of Singapore's top three residential property developers and retail mall owners and operators. It has also developed properties and malls in the UK, Australia, New Zealand, Thailand, Vietnam and China. F&N had divested 50% of its interest in this development land to FCL and recognised RM55mil in the quarter to March 31, 2012, being 50% of the capital gain of RM110mil. Meanwhile, most analysts concurred that F&N's earnings would pick up in the second half, but many were still uncertain of its prospects. While the soft drinks segment is doing well, the dairies segment both in Malaysia and Thailand is still uncertain, driven by high raw material costs, and downside bias from its flood recovery. “F&N is an extremely well-run company and I think they are doing the best they can. However, Malaysia is also a pretty matured market for dairy products. We don't expect to see huge growth in these segments. It will be stable in line with market at best,” said one consumer analyst. F&N's second-quarter ended March 31 net profits declined by 18.89% to RM107.06mil from RM131.99mil in the previous corresponding period as revenue dropped to RM730.43mil from RM1.01bil previously. It also declared an interim dividend of 20 sen, which will be paid on Aug 1. Ng said the key declines came mainly from the cessation of the Coca-Cola business, the 200-day flood disruption in Thailand and higher raw material cost and competitive pressure in the Malaysian dairy operations. Sales in Thailand dropped by half as production stoppage disrupted supply to the market. The Rojana factory in Thailand recommenced operations in March and ramped up to full capacity in April. Dairies Thailand's factory was affected by floods, leading to a 52% slump in its first-half revenue to RM231mil. As a result of the lower sales volume, the factory could not cover its overheads, causing an operating loss of RM30mil. “Even though we should see a stronger second half as Dairies Thailand resumed production in March, we cut forecasts to account for pricier raw materials,” said CIMB Research analyst Foong Wai Mun. F&N made a cumulative write-off of RM89.44mil for the current two quarters. Interim property damage insurance claims based on current replacement cost accepted by insurers and recognised to date were RM80mil, of which the insurers had disbursed RM74mil in payments. On a half-year basis, F&N's net profits dropped by 37.7% to RM148.8mil from RM239.07mil on the back of lower revenue, which declined to RM1.47bil from RM2.04bil previously. F&N mitigated the loss of the Coca-Cola contract by raising its soft drinks revenue without Coca-Cola) by 8%, driven by higher sales of Seasons, Redbull and its new products (Zesta and Clearly Citrus). Ng added that F&N was rethinking its fruit juice segment as it was also not growing. “Revenue was also helped by market penetration into Brunei and contract packing for exports to its sister company in Singapore. However, operating profit margins fell 7.6% to 9.3% due to higher commodity prices, especially for sugar,” said Foong. Meanwhile, Maybank analyst Kang Chun Ee said that until the shift to Pulau Indah, expected to be completed by September, F&N would continue to see rising operating costs as a result of a duplication in operations. A deferred tax assets (DTA) of RM55mil in relation to the halal hub tax incentive was granted to the plant and the estimated balance of RM21mil in DTA would be recognised in the second half of this year, said Kang. KOTA KINABALU: Suria Capital Holdings Bhd's venture into property and development is now taking shape after securing 9.4ha here for a landmark project. The group, which is involved in ports operations, bunkering services, construction and engineering, aims to have a mixed development there to complement Yayasan Sabah's proposed Sabah International Convention Centre (SICC) nearby. Suria group chairman Tan Sri Ibrahim Menudin said it now has the land title after paying half of the RM142 million land premium. "Before we begin the process to develop the land, the management is in discussion with some groups, which we hope to conclude before the next annual general meeting (AGM). "This project located next to the Kota Kinabalu port and the upcoming SICC will be a new landmark in the state capital," Ibrahim said after the group's AGM at Sabah Ports Sdn Bhd office at Sapangar Bay Port here yesterday. He said the project will involve a gross development value of RM1.8 billion, with construction spanning five to eight years. "The mixed development will include two hotels where we are looking at 800 to 1,000 rooms, plus commercial, retail and residential lots," he added. Ibrahim said besides the 5,000-capacity SICC, Yayasan Sabah reportedly will also build two hotels within the 10ha location. "We are not involved in that but as of now, I think they are in the process of doing a traffic flow study there to avoid congestion." Suria Group recorded RM276.01 million revenue last year, up eight per cent from RM254.97 million in 2010. Its pre-tax profit dropped to RM74.35 million from RM 75.56 million previously. SINGAPORE: A property developer is offering a family the chance to live for free for six months in a fully furnished condominium unit in Kovan. But it is not really a marketing gimmick to whip up interest in Fiorenza, launched last year, as all but two of its 28 units have been sold. Rather, it is a test bed of sorts for Koh Brothers, which hopes to gather useful feedback on “lifestyle living”, as opposed to just selling an unfurnished unit. Touted as a “concept home”, the two-bedder has space-saving, tech-savvy furniture suitable for smaller homes. Smart features in the fifth-floor unit include a dining table that converts into a coffee table, a foldable bed which can double as a study table, motorised sun shades and multi-room surround sound. The successful family who will not be obliged to purchase the unit should be a family of three, including a child, and be able to give fair feedback and comments about their experience. To apply, they will also have to submit a 100-word essay on why they deserve the “best experience in life”. Utility bills will be paid by the developer but the family will have to bear costs such as cleaning the apartment. The flat, fitted with everything from a washing machine to cutlery, measures 1,367 sq ft, of which nearly 500 sq ft make up the rooftop garden, leaving about 872 sq ft of indoor living space. Units at Fiorenza have been sold at an average price of S$1,000 to S$1,100 per sq ft. The “concept home”, with all its furnishings, will cost some S$1.6mil; the unit alone costs about S$1.4mil. Koh Brothers managing director and group chief executive Francis Koh said the idea for the “concept home” was conceived nine months ago. “It's a passion for us, to improve the living conditions for the dweller ... so that they can experience what is ambience, nice avant-garde furniture, at the same time optimise the space,” he added. He said the feedback he gathered would be used as tips for future developments. KUALA LUMPUR: Al-Hadharah Boustead REIT has recorded a higher profit after tax of RM21 million for its first quarter ended March 31 2012, from RM20 million posted previously. Its revenue improved to RM24.2 million compared with RM22.2 million previously, driven by higher fixed rental income. Chairman Tan Sri Lodin Wok Kamaruddin said in a statement yesterday that the increased contribution from fixed rental income was due to the additional plantation assets that were acquired last year. "We are confident of holding steady our earnings for the next three quarters. "Given its unique positioning of being the only local Islamic plantation REIT, coupled with improving market conditions and steady demand for commodities, we believe our unitholders will benefit from their investment," he said.